Premium UK retailer Debenhams has opened its first Australian store in Melbourne, offering a suite of exclusive designers and new services and technologies to attract customers. 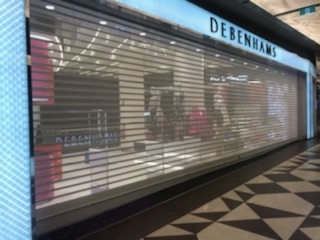 The 3600 square metre store is located in the basement of the St Collins Lane mall in Collins Street, and apart from a clutch of labels and designers never seen in the Australian market, Debenhams is offering innovative new services that will distinguish its offering from locals. Staff will carry mobile point-of-sale devices so sales can be completed anywhere in the store and customers will no longer be forced to wait in a queue to make a transaction. And a new Debenhams Australia app will enable shoppers to create a wishlist of items that will be ready and waiting to be tried on. 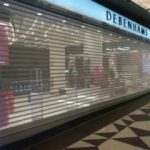 Mirage Doors were engaged to manufacture and install an 11.3 meter wide, Perforated Series 3 Aluminium roller shutter to provide maximum store access. The door required a custom shaped tapered bottom rail to match the floor line. Careful planning was required to deliver and manoeuvre the door into place in the busy Collins lane area. The result was spectacular.